For over 30 years, Chief Jim Boucher has been, and continues to be one of the most influential people in Alberta, and one of the most successful Aboriginal leaders in Canada. First elected in 1986, Chief Jim Boucher has served as Chief of the Fort McKay First Nation for 28 of the past 31 years. 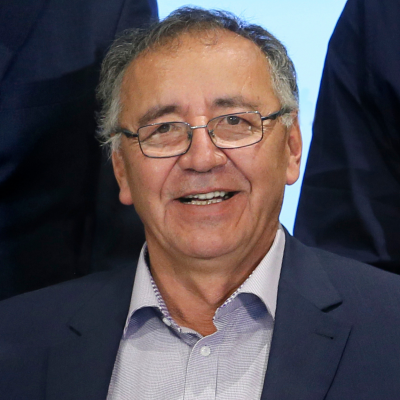 Chief Boucher also acts as the Chairman of the Board for Fort McKay Group of Companies – which operates 3 limited companies, 100% owned and controlled by the Fort McKay First Nation. Under his vision and leadership, FMGOC has grown into one of the most successful First Nation – owned business ventures in Canada, with annual revenues in excess of $500 million. Chief Boucher recognizes the importance of the environment and culture of Fort McKay First Nation’s location and has leveraged opportunities to enhance the community’s social and economic conditions through effective partnerships with industry and government. Chief Jim Boucher believes practice and preservation of the Fort McKay First Nation’s traditional ways of life can occur simultaneously alongside continuous and long-term sustainable oil sands development. In 2018, The Energy Council of Canada honoured Chief Jim Boucher as the 2018 Canadian Energy Person of the Year for his significant role as a National leader in both business and governance. He was also recently recognized as the Aboriginal Economic Development Corporation of the Year by the Canadian Council for Aboriginal Business and has been named one of the 50 most powerful people in Canadian Business by Report of Business Magazine. Not one to reflect too long on accomplishments and recognizing that Fort McKay’s future depends on its ability to grow sustainable initiatives, Chief Boucher continues to advance opportunities for Fort McKay such as working alongside with the Mikisew Cree Nation to invest in a 49 per cent stake in the Suncor East Tank Farm Development for total proceeds of $503 million in 2017. Chief Boucher says the basis for much of his success comes from “the combination of perseverance and having the right attitude.” Those who have worked with and for him will say his success is also due to his clear vision, consistent direction, his loyalty, and mentorship abilities. To many, he is a chief, a peer, a leader or a client — he is an ‘Elder’ in the best and truest sense of the word. On the home front, Chief Boucher is the proud parent of son Jonathan and daughter Jenica, and a proud grandfather to five grandchildren.